Do you need a drain survey or cctv sewer inspection? With the advancement in today’s technology and the development of high specification CCTV drain cameras Reading Drain Services are proud of the CCTV drain inspection service they are now able to supply to their clients. Our high tech drain inspection camera can be inserted, like a snake, into your clogged toilet or drainage system, and makes it possible for us to inspect, survey, and investigate, even the most complex of drainage systems. What Are The Main Uses Of A CCTV Drain Camera Survey? What Are The Benefits Of A CCTV Drain Inspection? 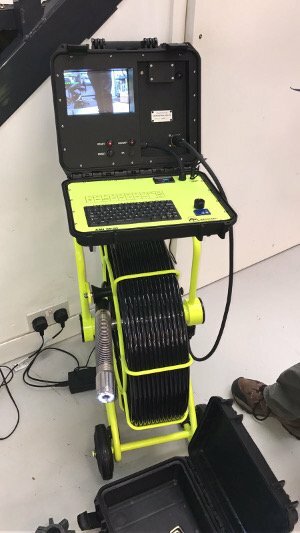 What Are The Costs Of A CCTV Drain Survey? Our qualified drain engineers can then assess the damage found by the survey and give you an estimate to perform a jet drain cleaning or unclog drain or for any repairs required. We will also provide you with a DVD for visual evidence of the drain problems you have. A CCTV drain survey, whether for commercial or residential premises, is the best way to find out the cause and the extent of any drainage problem quickly, visually and without digging up your property. It will also give you the peace of mind knowing that your drainage system is fully functional and in good condition. Our very small CCTV camera is inserted into your drainage system and provides us with an interior view of your drain and shows any structural defects or other issues that might be the cause of a blockage or other problem. As the drain camera is moving along your drain pipe the images it picks up are recorded. Once the CCTV drain survey has been completed the image from the drain camera are saved to be viewed at a later time, convenient to you. We will then discuss the results of the CCTV camera inspection and give you advice on the best course of action to remedy any problems found. Avoids expensive drainage groundworks excavation work. Provides confidence about drainage before a house purchase. A recent recording of a drain system is a good selling point when selling a house. Recommended as a regular method of maintaining drainage systems and as a way to avoid future problems that could lead to more serious and costly blocked drains or drain relining situations. What Are The Costs Of A CCTV Survey? Reading Drain Services are now able to provide their clients with a fixed cost fee for all of our CCTV drain inspections. In addition to our detailed report which explains the structural condition of your drainage system, you will also receive a DVD showing the CCTV footage of the insides of your drain. We will also give you our recommendations for any necessary works to remedy any problems we identified with the drain inspection. Reading Drain Services are your local drain experts throughout Berkshire and surrounding areas. We are able to provide a complete CCTV drain survey service. As an independent family-run business we pride ourselves on personal customer service. Telephone calls are answered personally.